We have a great variety of different swimming pool options available. At South Pacific Pools and Spas we have you covered for all of your maintenance and servicing needs including pool painting, pump and filter installation along with solar heating installation and repairs. 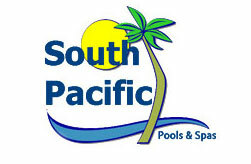 South Pacific Pools & Spas Geelong is locally owned and has been operating in Geelong for over 30 years. South Pacific Pools & Spas Geelong specialises in the installation of Inground Fibreglass swimming Pools. Our Pools are manufactured by Harvest Pools, located in the Hunter Valley, NSW and are 100% Australian owned with 13 styles and 15 great colours to choose from. We have a pool to suit any backyard, lifestyle and budget. South Pacific Pools & Spas Geelong is the largest retailer of spas and swim spas in the Geelong region and is a member of the "JUST SPAS" group and are proud to be able to offer spas and swim spas that are made in Australia. All spas and swim spas are manufactured by Spa Industries Global in a state of the art facility located in Hallam, Victoria Australia. You can be rest assured that warranties are factory backed and spares are readily available. South Pacific Pools & Spas Geelong also have a range of quality Saunas - "Traditional" and "Far Infrared" check out our range under "Saunas"
We offer regular servicing/maintanance for your pool and spa, our fully trained service technicians can carry out most repairs on your pool and spa equipment. We also carry an extensive range of spare parts and accessories and offer "FREE" computerised water testing. Most importantly, we strive to offer excellent before, during and after sales service, customer satisfaction is of paramount importance to all at South Pacific Pools and Spas Geelong and welcome any feedback on our performance.